Legend has it that during World War II American soldiers in Rome would bring their Italian friends eggs and bacon and ask them to make a pasta dish, thus becoming pasta alla carbonara. Another legend claims that carbonara, a derivative of the word carbon in Italian, was made for charcoal workers. Who really knows how eggs and bacon became transformed into a distinctively Roman pasta dish. One thing is for sure, with the bacon grease that's used it is certainly a meal hearty enough for a soldier or charcoal worker. So if you're on a low-fat or low-carb (or both) diet, you may as well stop reading right here. Shut your computer down and go get an apple. If you love bacon, then take my hand and let me lead you down the long path of gluttony. It's a fine journey. In Rome salted pork jowl is usually used, but as it’s difficult to find in the States, pancetta or a smoky bacon works just as well. Cut the pancetta or bacon into ¼ wide slices. Lightly mash the garlic with the flat end of a chef’s knife, enough to split it and loosed the skin, which you want to toss. Put the garlic and olive oil into a small sauté pan and heat over medium high until garlic turns a deep golden brown. Remove and throw away the garlic. Put the pancetta slices into the pan, and cook until lightly brown and crisp at the edges. Slowly add the white wine, and let it cook a minute or two until the alcohol burns off. Break the 2 eggs into the bowl in which you will be serving. Beat them with a fork then add the grated cheeses, a healthy grinding of pepper, and the chopped parsley. Mix thoroughly. Briefly reheat the pancetta over high heat then remove from heat. Add a small amount of the pancetta drippings to a small amount of the just cooked spaghetti and mix well. Add to the bowl and toss rapidly, taking care not to cook the eggs. 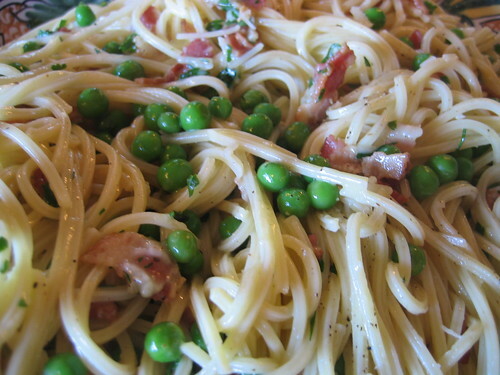 Toss in the rest of the pasta, cream (if using), pancetta with its drippings, and peas, and toss thoroughly. Note: I've never had problems using raw eggs, which can transmit salmonella, as I've always used the freshest ones I can find. But if you are concerned, or will be serving to young children, elderly people or those with a weakened immune system, you may wish to skip the raw eggs and add cream instead. The debate over what is "proper" in cooking is age old, but one thing is for certain, it's only through new combinations that the art advances. This seems like a heavy meal, but I won't hesitate to try since peas are my favourite, so small yet so tastyy!! I remembered the time that me and my girlfriend was making our white sauce for Penne Pasta. We were lacking on white cream. It's good that we had an extra can of cream of mushroom left on our storage and just experimented on the flavor. It still it turned out to be delicious. :) My girlfriend really loves to eat pasta, especially when its white sauce. Oooh was always wondering why this pasta is called carbonara. Now, i know. Anyway, i'll try this recipe. I've always been in search for the best tasting carbonara. So far, i've only found 2 that really amazed my tastebuds. Gotta try this one! Calvin Trillin suggests eating pasta carbonara instead of turkey on Thanksgiving (overeat something delicious, he suggests), and one year, when I hosted, I warned that the food wouldn't be traditional and served approximately this recipe, without peas or cream and skipping a step by using garlic-infused oil. No one complained too much. More recently I've served this to groups around Thanksgiving in honor of Calvin. I love the idea of preparing a non-traditional Thanksgiving meal, or any holiday meal for that matter! My mom and I made an all Italian menu one year and it was wonderful, although my brother complained a bit :) What better way to create a new tradition, or honor a wonderful writer of food. Cheers to Calvin! Great recipe and suggestions Sheri. I like to add just a small pinch of chilli powder or cayenne pepper while I'm frying the bacon or panchetta. And don't forget to serve some wine, perhaps an <a href="http://www.vinodiversity.com/arneis.html" rel="nofollow">Arneis </a>or a Lagrein Rose. As a fan of spaghetti alla carbonara, this recipe looks fantastic! And I am all about the peas - a nice change and great added color. If you are going to add some extra spicy heat, an off-dry Riesling would be a great pairing and even a dry acidic Riesling would work.